The history of British television has been written as a 'history' distinct from memory. The idea that memories of television are continuous with its history is less well developed. How is British television remembered and by whom? What part do producers' memories and the media heritage industry play in constructing television's past? These questions drive the overriding objective of the Inheriting British Television research project: to interrogate how ‘British Television Heritage’ is articulated by television producers and media museums/archives. A key element of the research project will integrate knowledge co-generation with practitioners in developing an understanding of television’s past. 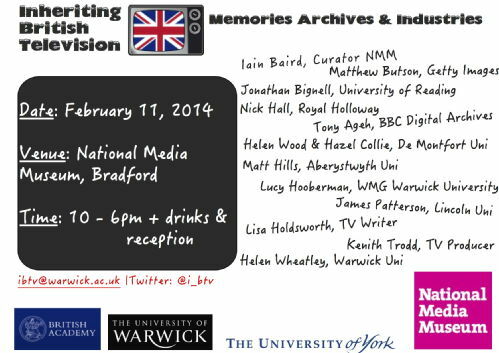 This project ran a symposium at the National Media Museum on February 11th 2014 for researchers, practitioners and media heritage workers involved in the production of television as heritage, memorable and archivable. During the project (2013-2015), the investigators undertook a series of oral history interviews with television producers, screenwriters, archive managers, production workers, extras and heritage organisations. The data gathered is being analysed and disseminated in a co-authored monograph entitled Inheriting British Television: Memories, Archives and Industries (BFI) forthcoming in 2017. The project was funded by a British Academy Small Grant which ran from October 2013-Sept 2014. The principal investigator is Dr Joanne Garde-Hansen (Warwick) and the co-investigator is Dr Kristyn Gorton (York). Tony Ageh, Director BBC Archives and Digital Public Space – What’s the point of a TV Archive? Kenith Trodd, Television Producer - “I’M OUT OF HERE IN THE MORNING”: Is There a Future for The Past? 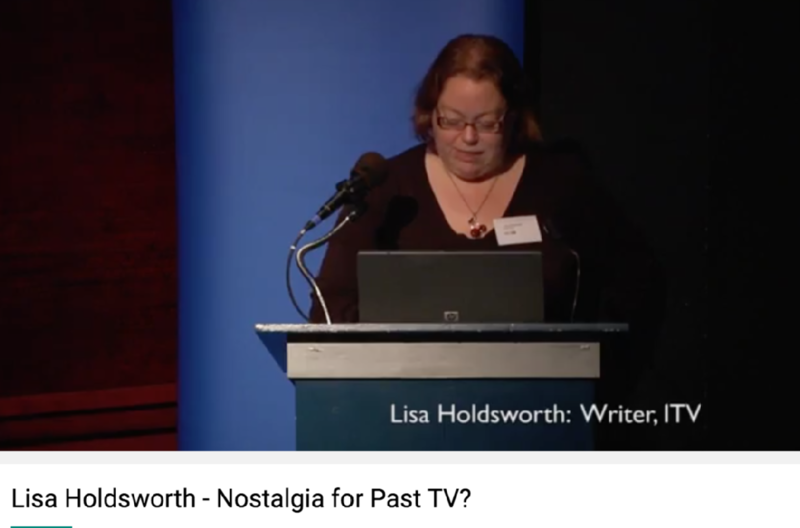 Lisa Holdsworth, Screenwriter – Nostalgia for Past TV? Lucy Hooberman, Professor and Director of Digital Media and Innovation, University of Warwick – What is Television Now?